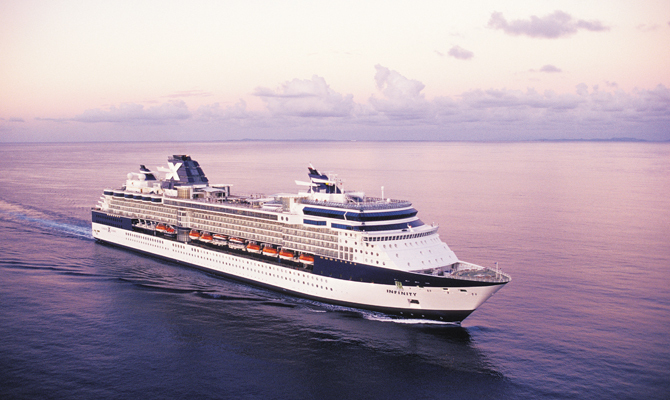 The Celebrity Cruises Classic Drinks Package offers you more choice than ever before. You can now choose from an incredible array of beers, spirits, cocktails, liqueurs, frozen drinks and wine by the glass up to $9. What’s more, if you’d like to upgrade to a drink from the Premium Drinks Package, you’ll only pay the difference. Plus, you’ll still receive a 15% discount on all wines by the bottle, even from their prized reserve and rare wine lists. What’s not to love? Vodka A Day At The Beach House collection of most popular grape varieties, such as Chardonnay, Sauvignon Blanc, Merlot, Pinot Noir & other red blends. 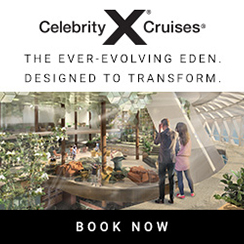 Celebrity Cruises are introducing Celebrity Edge to the world with a choice of exclusive 7-night Caribbean itineraries throughout winter 2018/19. 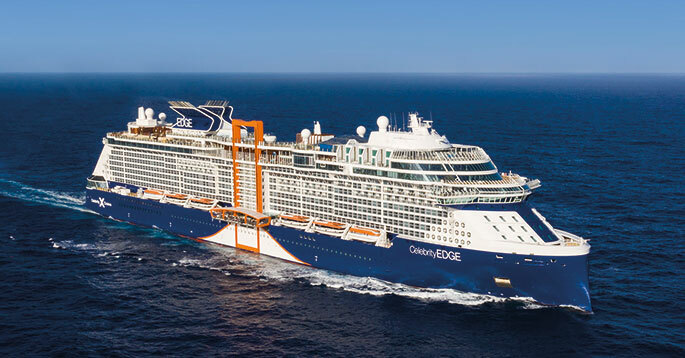 Closer to home, Celebrity Edge will offer a range of 7-, 10- and 11-night sailings out of Rome and Barcelona for 2019, including an exclusive sailing direct from Southampton. From Valencia to Valletta and Monaco to Mykonos – with longer stays at every destination, you will uncover more of Europe in every direction – as well as two brand new ports of call; Nauplion on Greece’s Argolis Peninsula and Santa Margherita, the gateway to Portofino on the Italian Riviera. 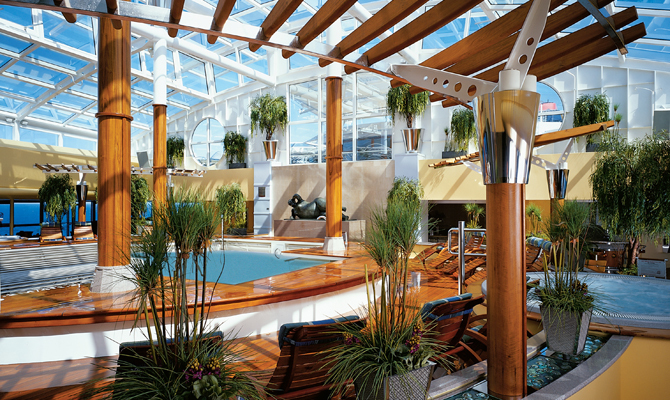 Eden is unlike anything at sea – or anywhere. With three levels of sensory experiences, fully encased in glass and looking out to the ocean, it is a true window to the world. Where nature is effortlessly intertwined with design and performance art. From the awakening aromas rising from Eden Café to the natural scents of the Library of Plants growing above Eden Bar; from the divine, experiential cuisine at Eden Restaurant to the crescendo of theatrics that close the night while delighting your eyes and ears… we invite you to indulge every sense in a space that transforms from chillful mornings to playful afternoons to sinful evenings. Three decks of windows offer stunning views that connect you to the sea. Eden in the morning is a chillful place. The atmosphere invites you to explore by the morning light. Every space is open to discovery. 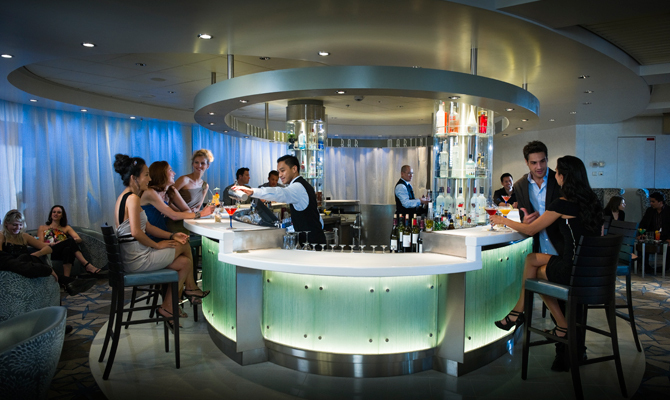 Eden Café offers a wide variety of morning beverages and casual breakfast bites. Bright and airy, the three stories of windows offer stunning views that connect you to the sea. 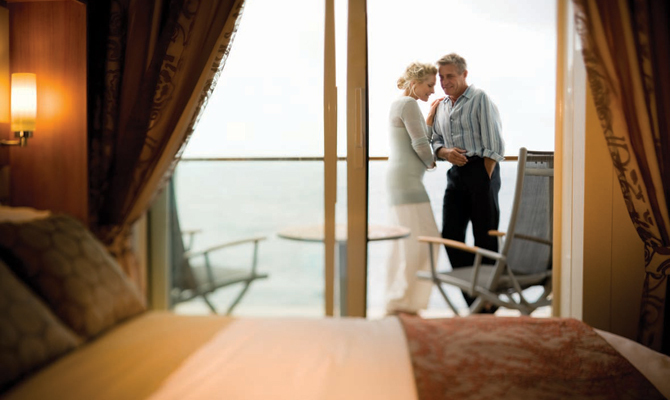 Cozy Lookout Points are luxuriously furnished and offer the perfect place to chill—on every level. Classes, unexpected musical performances, and artisanal cocktails kick up the social vibe. Eden in the afternoon is a playful place where a social vibe kicks in. Join cooking classes, learn new tricks for the tastiest cocktails, and brush up on your wine knowledge with tasting and pairing seminars. Atmospheric sounds fill the air and unexpected musical performances begin to awaken your senses even further. Step up to the Eden Bar for an artisanal cocktail made with fresh ingredients from the herb wall. 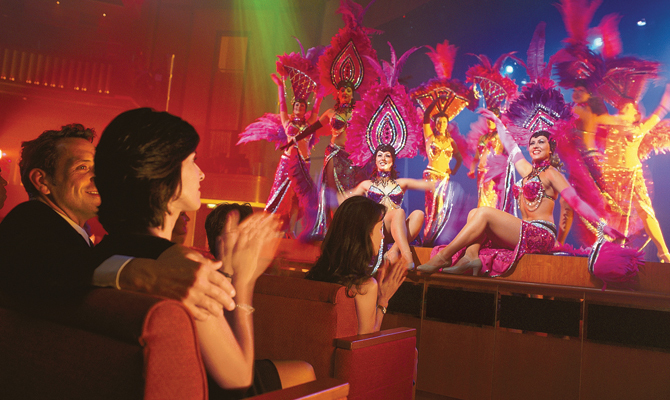 An indulgently sinful fusion of performance art, culinary treats, and nightlife.. The evening ushers in the ultimate experience in an indulgently sinful fusion of performance art, culinary treats, and nightlife. The energy turns inward as the outdoor views fade into darkness. Eden at night is an extravaganza of sensory enchantment and social magic. And, Eden Restaurant offers a unique, personal culinary journey that will not only thrill your taste buds, but every other sense as well. 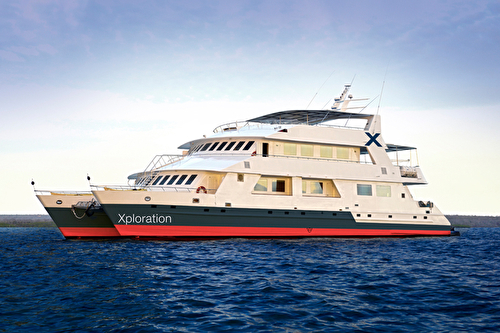 Celebrity EdgeSM will be followed by a sister ship, Celebrity Apex in spring 2020. 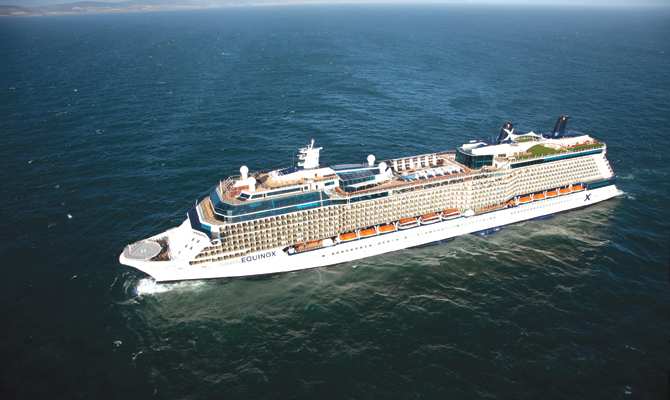 Third and fourth Celebrity EdgeSM Class ships will join the Celebrity Cruises fleet in late 2021 and 2022 respectively. 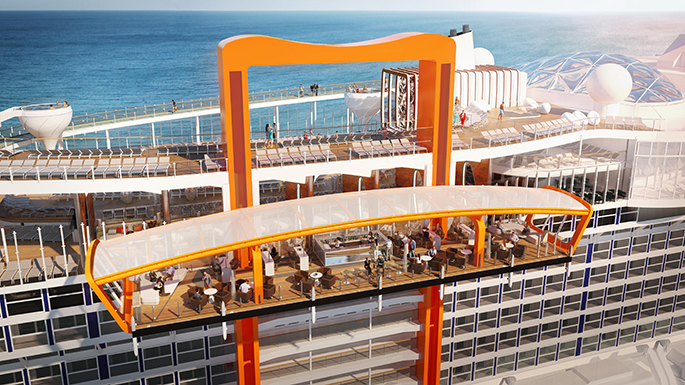 Celebrity Edge, is the revolutionary new way to experience the world, begins island hopping through the Caribbean in October 2018. Celebrity EdgeSM changes everything. 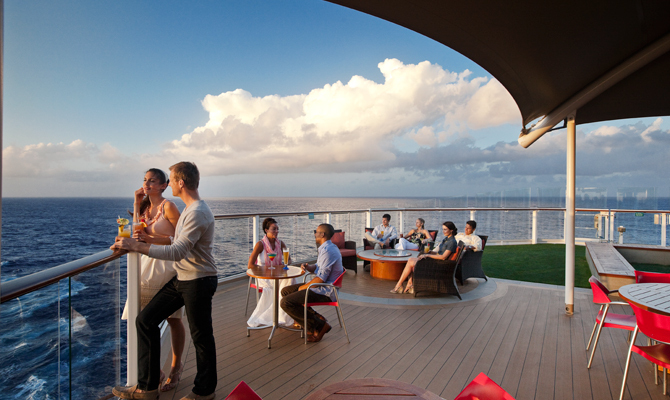 The way you experience the world; the way you connect with the ocean; the way you play, dine and unwind at sea. 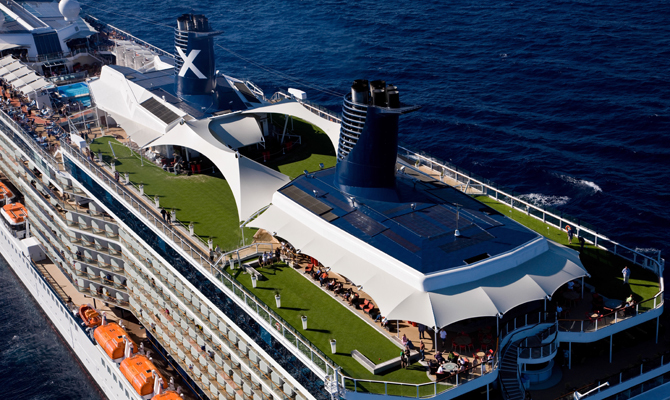 Revolutionary on every level, she’s the ship that’s setting a new standard of luxury and innovation at sea. We’ve made the seemingly impossible, possible. 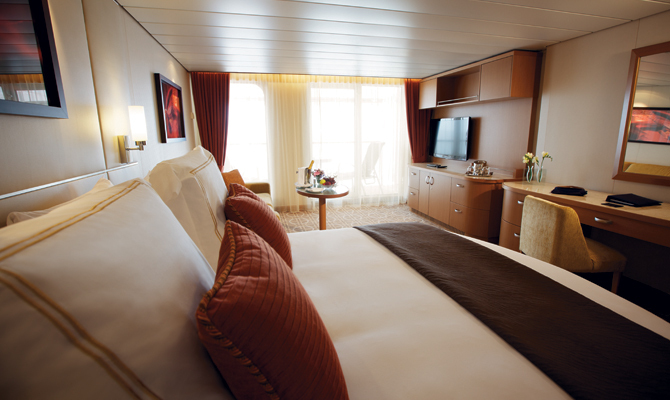 Through teaming up with some of the world’s best designers, we’ve created accommodation that has never before been experienced at sea. Our secret? 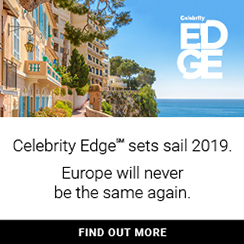 We selected designers who were new to the cruise industry, because we wanted to ensure every aspect of Celebrity EdgeSM would be a departure from traditional thinking about cruising. 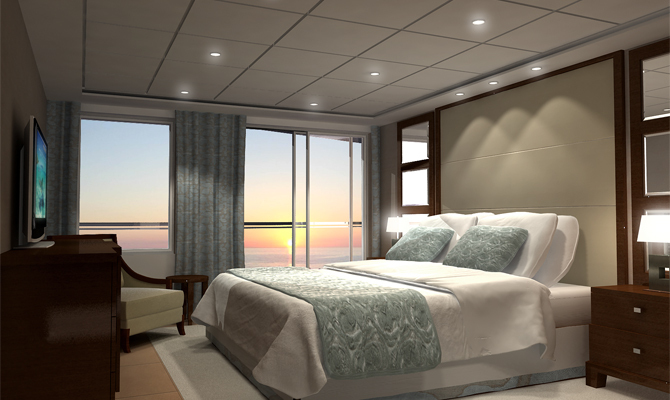 Our new Edge Staterooms feature an Infinite BalconySM – touch a button and your entire living space becomes the balcony, letting you walk right out to the water’s edge. 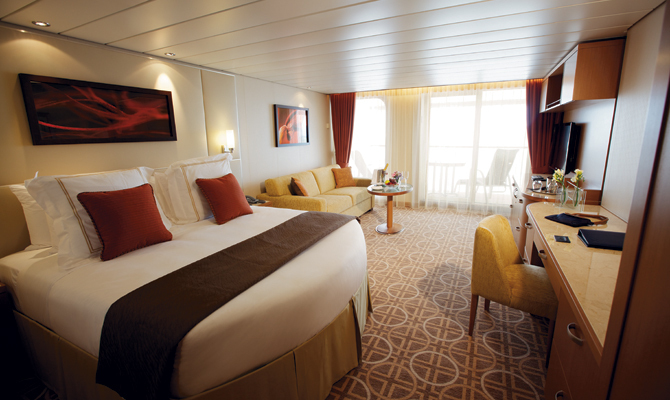 We created two exciting new suite categories too, and more than doubled the number of suites available. Our new Iconic Suites are now the most luxurious and spacious in our fleet; while our six 2-storey Edge Villas boast 950 square feet of split level, indoor-outdoor splendour. 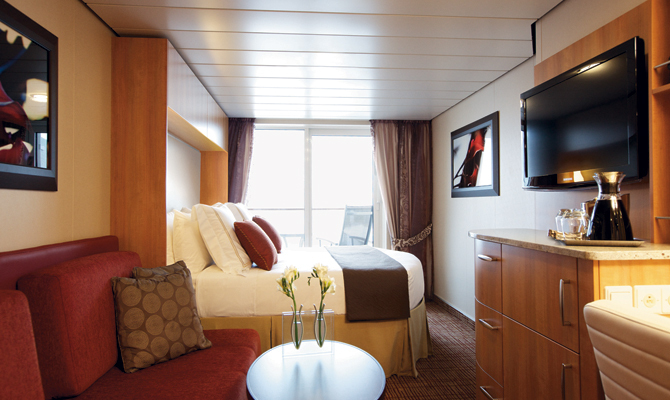 We’ve even created 174 connecting stateroom options, meaning you can connect different rooms for a whole new space. 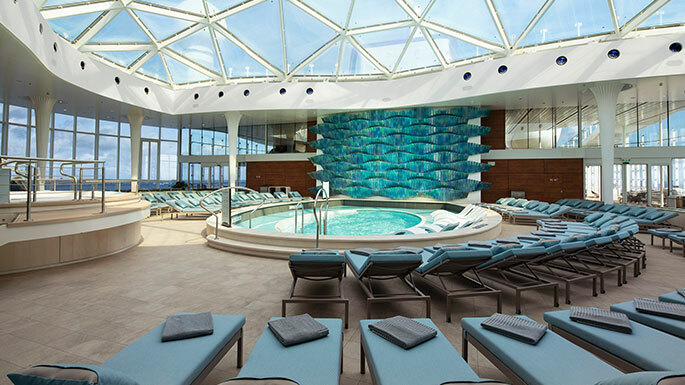 On Celebrity Edge, anything’s possible. The highlight of our outward-facing vision is the Magic Carpet. The size of a tennis court, and reaching heights of 13 storeys above sea level, it is the world’s first cantilevered, floating platform. 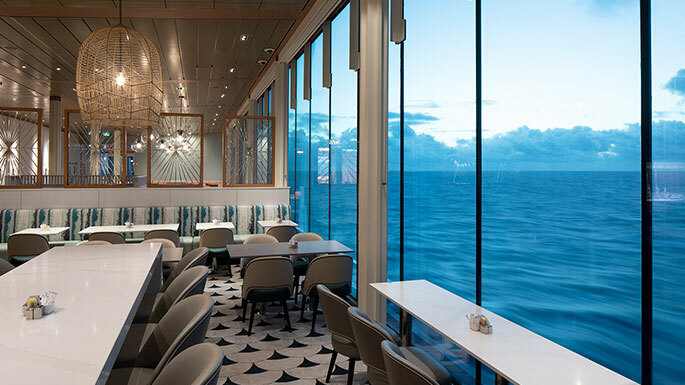 Majestically situated on the starboard side of Celebrity EdgeSM, making the ship’s sleek profile recognisable from miles away, it is designed with comfortable seating, a full bar, and space for live music performances – so it truly is a destination itself. 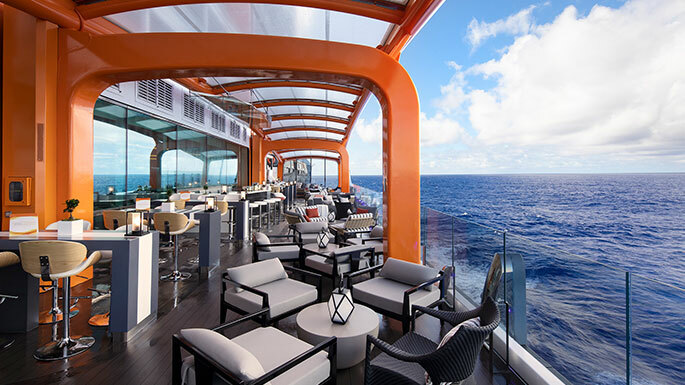 This spectacular space opens to several decks and transforms into a new and exciting venue depending on where it’s positioned – from an extraordinary viewpoint at the very top, where we host mouthwatering experiences such as Dinner on the Edge, to an extension of our luxury embarkation station, The Destination Gateway, on Deck 2. 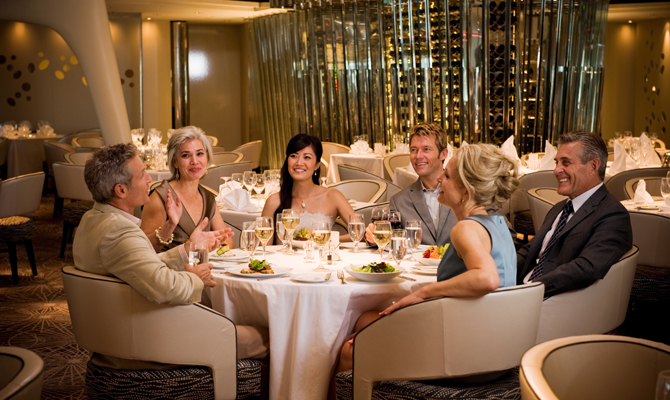 We invite you to soar over the open ocean while you dine, drink, or simply relax. 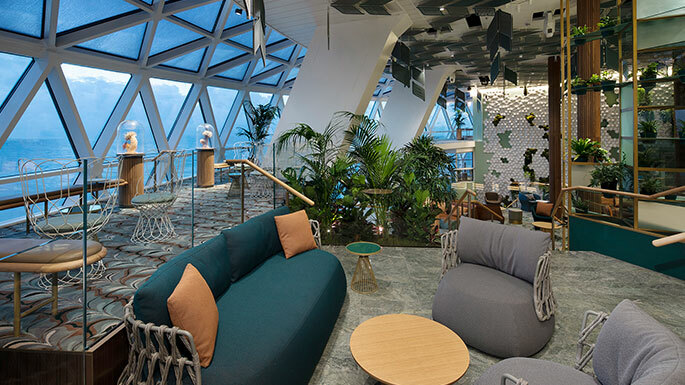 After the two-year design period was complete, the question remained, “Where will we go with Celebrity EdgeSM first?” With an incredible ship designed to highlight the destinations, we decided to start in the corner of the world so often referred to as ‘paradise’ – the Caribbean. 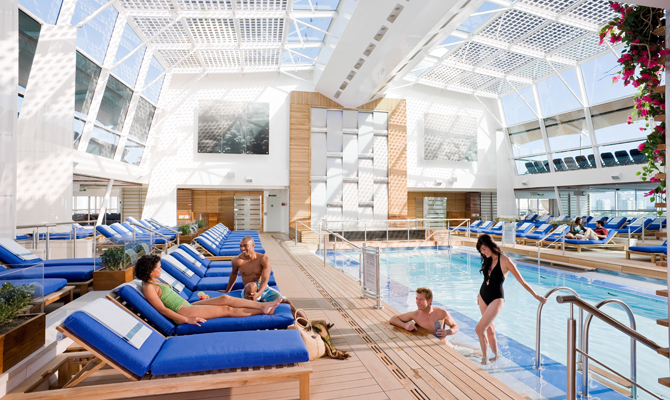 Celebrity Edge offers a choice of 7-night sun-soaked itineraries from Fort Lauderdale, Florida. Uncover the best of the Eastern Caribbean with ports of call including San Juan, Puerto Rico; Tortola, British Virgin Islands; and Philipsburg, St. Maarten. Or take a Western Caribbean voyage to Key West, Florida; Costa Maya, Mexico; Cozumel, Mexico; and George Town, Grand Cayman. But why choose just one? 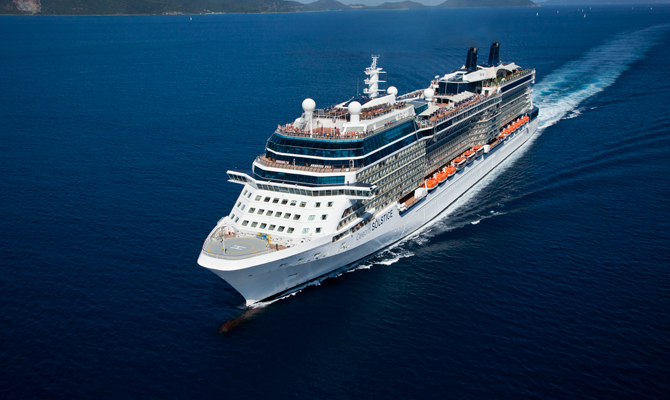 See it all by booking back-to-back sailings for a 14-night luxurious journey. 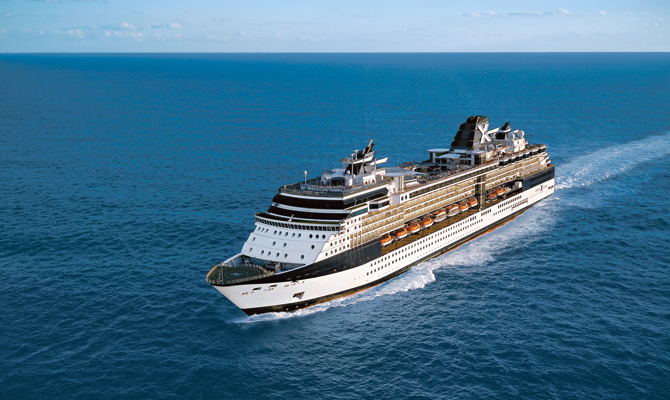 The minute you set sail, you’ll feel completely connected to the islands around you – and every shimmering nautical mile of sea that connects them. With oversized art installations including unique treetop sculptures; two 2-storey Martini glass hot tub; and 165-square-feet by 18-feet-high private Cabanas, The Pool Deck is a spectacular asymmetrical space with a distinct resort-style atmosphere. 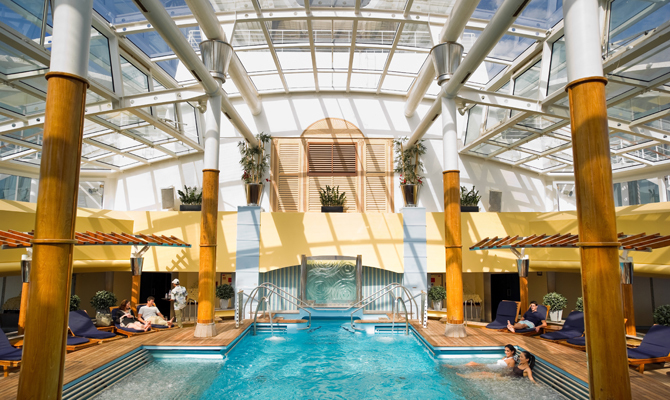 Situated alongside the 23-metre lap pool (the largest in our fleet) and underneath an ever-changing, abstract mirror installation is the Pool Bar. 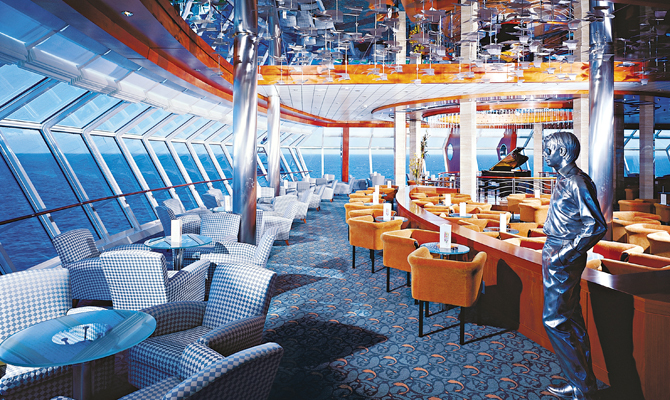 An serene spot to relax, sip your favourite cocktail and take in your stunning surroundings. 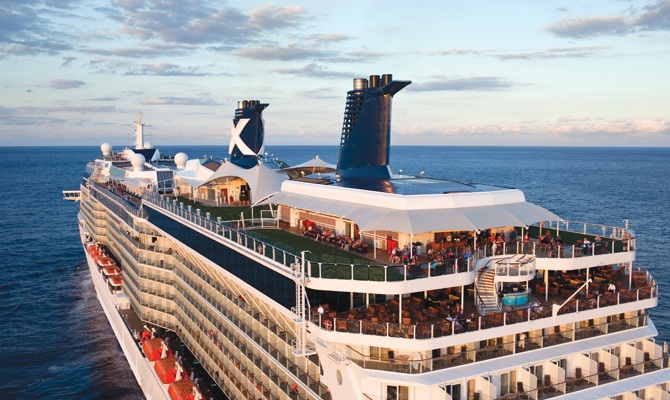 With Celebrity Cruises® you can travel to a choice of over 270 destinations, across seven continents, amid style, sophistication and incomparable comfort. 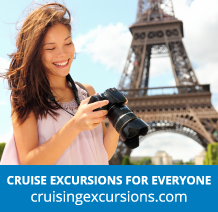 This includes trips to the USA and Canada, The Panama Canal and the Caribbean, as well as Asia cruises and much, much more. When your holiday experience combines award-winning cuisine with first-class accommodation and intuitive service, that’s what we call Modern Luxury. 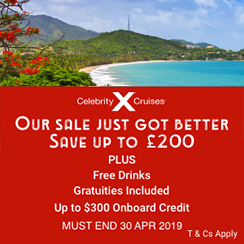 And now, cruising with Celebrity has just got even better, with the launch of the fantastic 123go! promotion. Celebrity don’t think you should ever settle for anything less than the extraordinary. So they took relaxation to new heights and added things like a half-acre lawn club with lush green grass — right in the middle of the ocean. 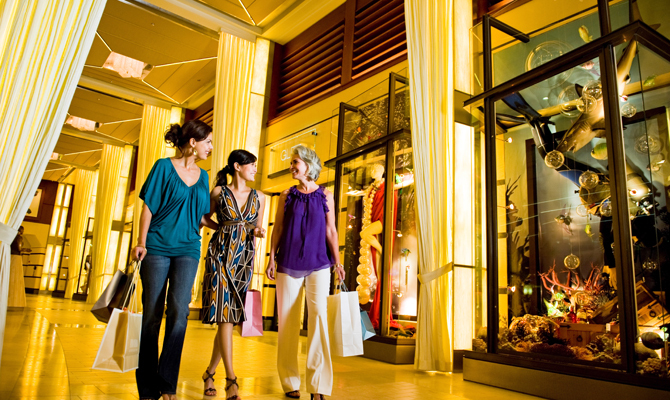 They also rethought everything about what makes a holiday more luxurious, more unexpected and more unforgettable. And didn't scrimp on a single detail. 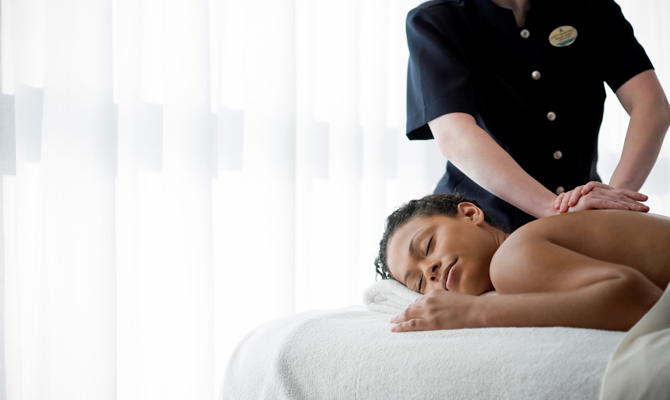 How much pampering does the perfect escape include? 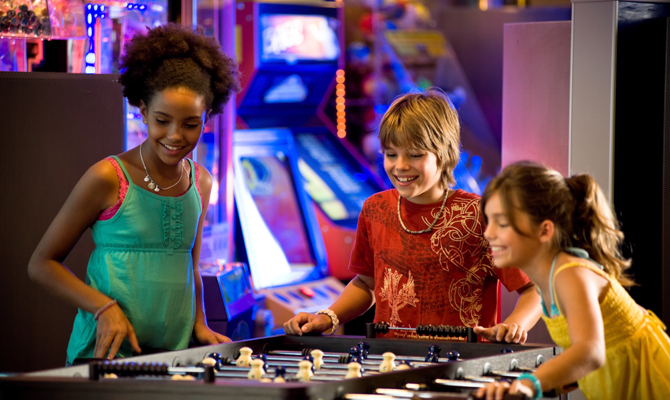 Celebrity have elevated the fine art of spoiling you to offer an exhilarating holiday experience unlike anything else. 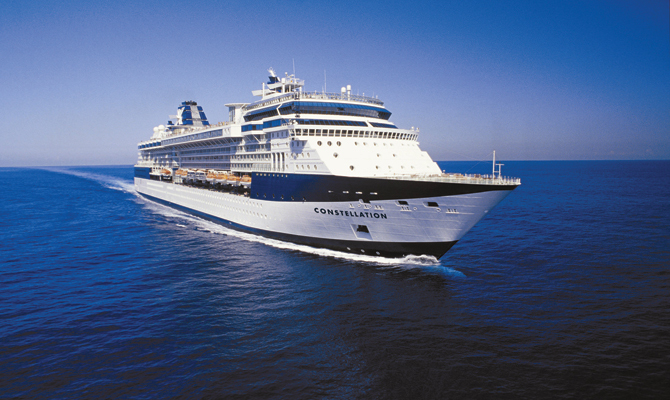 In fact, they're constantly ranked one of the best mega-ship cruise lines, thanks to their award-winning dining, stunning ships, such as Celebrity Millennium and Celebrity Eclipse, contemporary on board entertainment, unparalleled service, and accommodation that makes you feel like you’re the centre of the universe. Which is precisely as it should be. Having spent a few days acclimatising to the weather in Miami, which was unusually cold, we were very happy to embark on a ship heading for the Caribbean. The Port of Miami was extremely busy, as always but, with their experience of embarking (and disembarking) thousands of cruise ship passengers every day, the port authorities had us on board in no time. After an early morning drive to Birmingham Airport we made use of the Meet and Greet parking which worked perfectly, despite us arriving in two separate vehicles. A long queue had already formed to check in for our Monarch flight to Rome however, any thoughts that there may be a problem getting on board were quickly dispelled by the sight of a Celebrity cruises representative who was on hand to answer any questions and check our names off on her list. 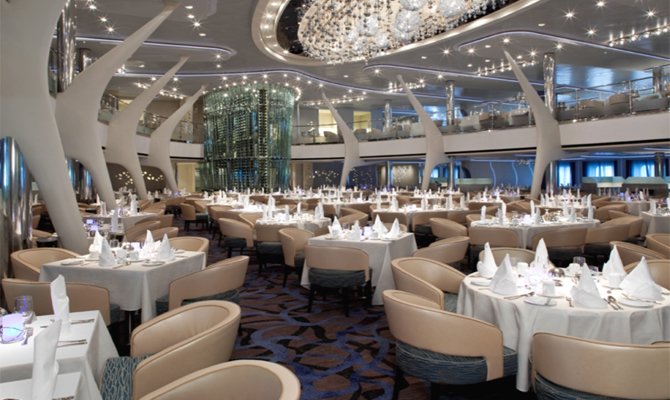 Once again Celebrity delivered; Celebrity ‘Reflection’ is slightly different to the other Solstice ships, minor changes on deck four instead of Quasar disco this is now the conference centre, aiming at the conference and incentive market. 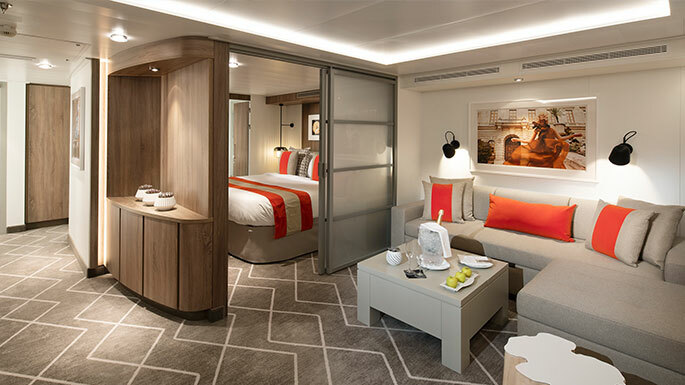 I was invited by Voyages of Discovery to spend a night onboard Voyager in Portsmouth, to see the results of her recent upgrade, before she headed off to the Caribbean on her first cruise. We flew from Heathrow to San Francisco with American Airlines, our preferred airline, via Chicago where we cleared customs and went through the obligatory Immigration Inspection, now all fingers on both hands and a photo, it makes one wonder what they will want in the future!